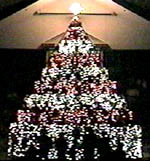 1999 was FBC Centre's first year using the MidiLite system. They are started with a mini-matrix (3x8x6) on their 8 tier tree but are pre-wired for a full 8x9x6 matrix and plan on expanding in the future. They are using our new MidiLite "3-fer's" which allow the lights, breakouts and cables to be installed as if it's a full matrix and then blocks are tripled up at the dimmer racks. When expanding, they simply remove the 3-fer's and add more dimmers. They used an iMac computer running Digital Performer to control their system. or call the church at (256) 927-3316.